NEW STOCK JUST ARRIVED AND IN SIMPLY STUNNING CONDITION THROUGHOUT. 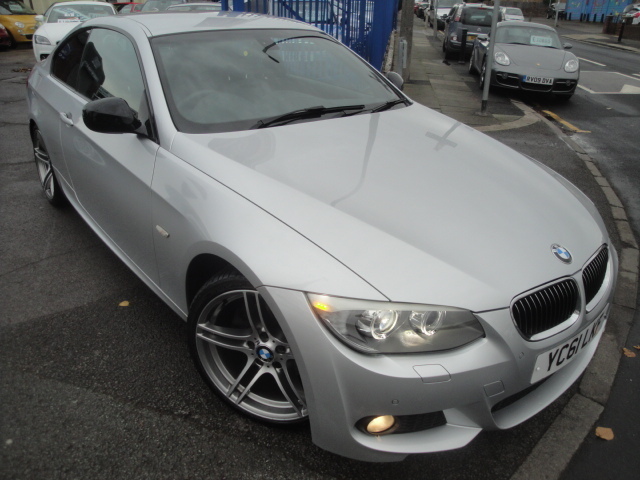 THIS IS A 2 PRIVATE OWNER VEHICLE AND HAS BEEN MAINTAINED TO THE HIGHEST STANDARD AS THE FULL SERVICE HISTORY HAS ALL BEEN COMPLETED BY THE BMW MAIN AGENT SINCE NEW. THE CAR COMES WITH A FANTASTIC SPECIFICATION INCLUDING FACTORY SAT NAV, BLUETOOTH CONNECTIVITY, POWER FOLD ELECTRIC WING MIRROS, HEATED SEATS, FULL SPORTS LEATHER INTERIOR, THE MOST STUNNING 19" DIAMOND CUT M DOUBLE SPOKE ALLOY WHEELS, REAR SPOILER AND AUDIO/VISUAL PARKING SENSORS TO THE FRONT AND REAR OF THE CAR. COMES WITH ORIGINAL SERVICE BOOK, HAND BOOKS AND 2 KEYS. SERVICED AT 16904, 33098, 48914, 56463, 65077 AND 72501 MILES ALL OF WHICH HAVE BEEN CARRIED OUT BY THE BMW MAIN AGENT.